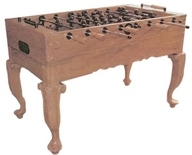 Great Lake Darts (GLD) is the company that owns and manufacturers the Fat Cat foosball table brand. GLD was established over 30 years ago and has been manufacturing and distributing their own lines of family gaming products throughout America. Their company roots started out as a darts manufacturer and has expanded into other products over the years. 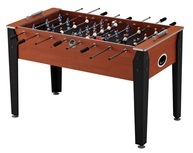 They now make darts, air hockey, table tennis, billiards and home casino products. 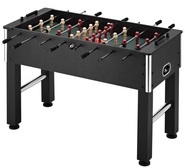 They also make another foosball table brand called Viper. Fat Cat are middle of the road tables in terms of their quality and can typically be found online or in department stores. 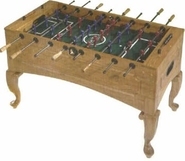 You wouldn't find a Fat Cat table at a professional foosball tournament but they make great quality foosball parts. 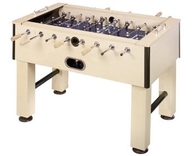 These tables are manufactured and marketed towards families and kids who are looking to seek enjoyment out of the game of foosball rather than perfect it as a professional sport.